Happy Wednesday! I love all of the pieces involved in today's outfit- each piece is versatile on its own, yet together it's like the perfect pieces to this outfit puzzle. I had other options for the blazer in mind, but red felt right with Valentine's Day right around the corner. Added the red lip to match. Talking about love, my poor boyfriend has been sick (longest flu season everrr!) I thank my lucky stars, my constant chugs of Airborne and the flu shot I got at work, that I haven't come down with it. I also want to thank my extremely supportive sister for filling in as photographer amidst feeding her kids, helping my nephew with his WWE sign and all those good ol' tasks of a hard working mother- love you sister! *Also, today is the last day to enter my "Not Rated" boot giveaway! see how to enter here! Great blazer! You look amazing! cute look! i've been sporting something similar this week. So pretty ! Love the blazer and shoes. Love this look!! Those heels are FAB!!! Red is such a beautiful colour on you Pau! Love the blazer. love this look and love the scenery! you look so pretty! Best combo ever. Bracelets are amazing specially the laced up one. 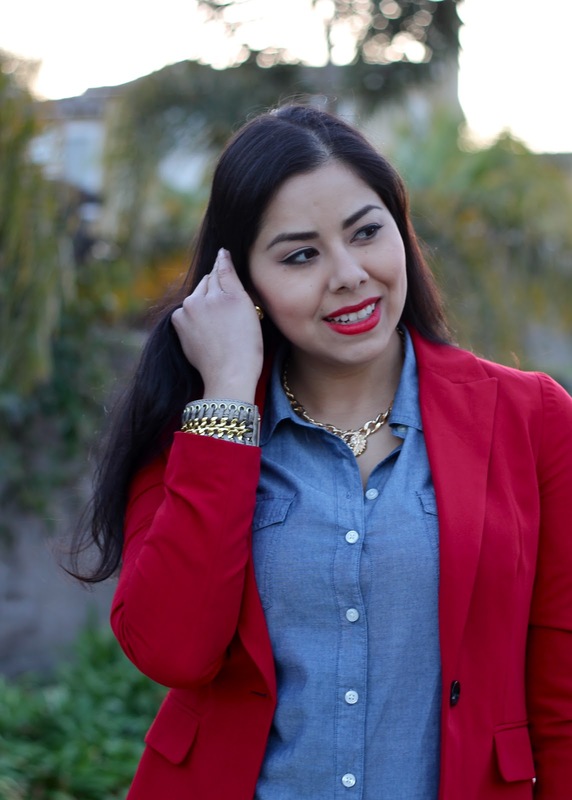 Love the red, chambray, and leopard:)! Beautiful look girl! 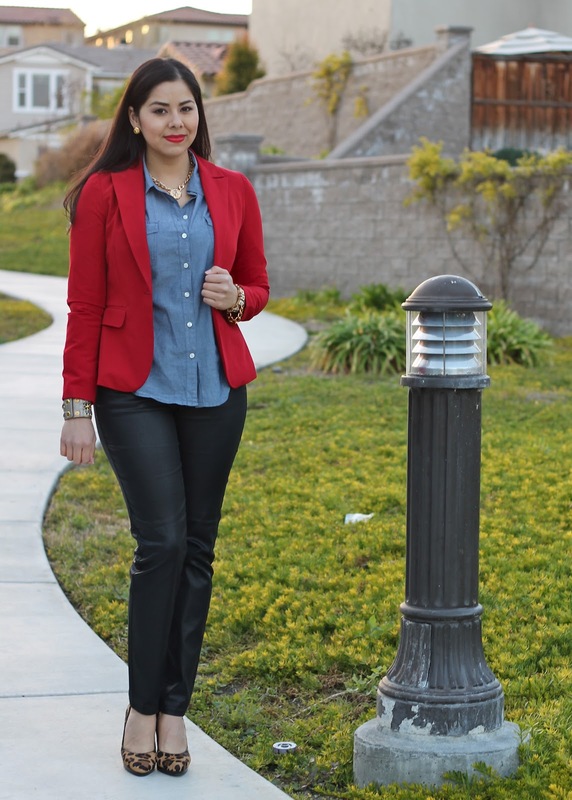 Love the chambray and red combo! Love, love, love the shoes! I need a pair of that in my shoe list! Thanks for swinging by my page! Cute outfit! I love that red blazer. Opps... I was sharing your blog with my sister and lost my link to copy/paste. This is so pretty and classy. Love it! I take Airborne all the time. I'm so paranoid about germs! I really love this look from head to toe - the red and leopard are so gorgeous together! Love the red with the leopard print accents in the form of your shoes! Great look. And here's to not catching the flu bug this season! love you look babe, by the way do you mind following each other? love the way you pulled this outfit together with the leopard heels and red lips! i also love your arm swag.